The Tang dynasty was considered the first golden age of the classical and now iconic Chinese gardens. Emperor Xuanzong built the magnificent imperial Garden of the Majestic Clear Lake as an homage of life itself and from where he ruled. Players will act as Imperial Garden Designers and they will be called to build the most incredible garden while balancing the elements of Nature. 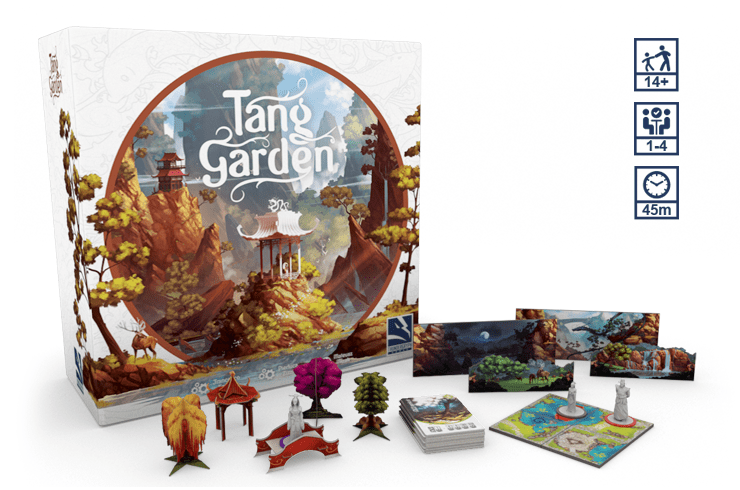 Tang Garden is a Zen-like game that will take you to the first golden age of China, where players will progressively build a garden by creating the landscape, placing the scenery and projecting their vision through vertical panoramas. During the construction, noblemen will visit the garden to admire the surroundings and the way the natural elements coexist in the most breathtaking scenery humankind has ever laid their eyes upon. 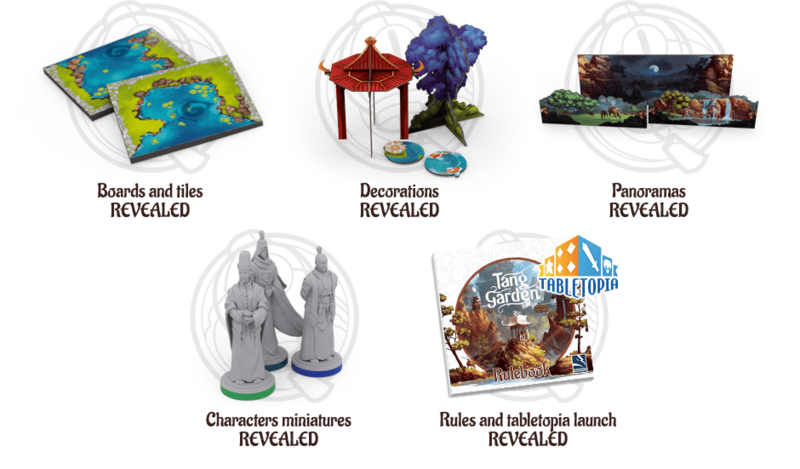 Subscribe to know when Tang Garden goes live on Kickstarter and get a limited edition Apricot tree decoration card and miniature if you back the game. Additionally, to commemorate Earth Day we will plant a tree with Trees for the Future for every subscription we receive. For more information on this initiative please visit our press release. Join our competition to explore Tang Garden by returning each week and get a golden lantern! Each lantern will give you a chance to be one of the three winners of a retail copy of Tang Garden. Since ancient times, imperial garden designers put particular attention to the balance and variety of the natural elements. The garden had to be a faithful reproduction of the Chinese territory: everything had to coexist in a perfect balance, and moreover, particular attention had to be placed in building the observation points. In the game, the garden tiles truly reproduce this aspect. During each round, one of the actions available to players will be to expand the garden horizontally with various types of terrain: water, rocks, vegetation and paths. 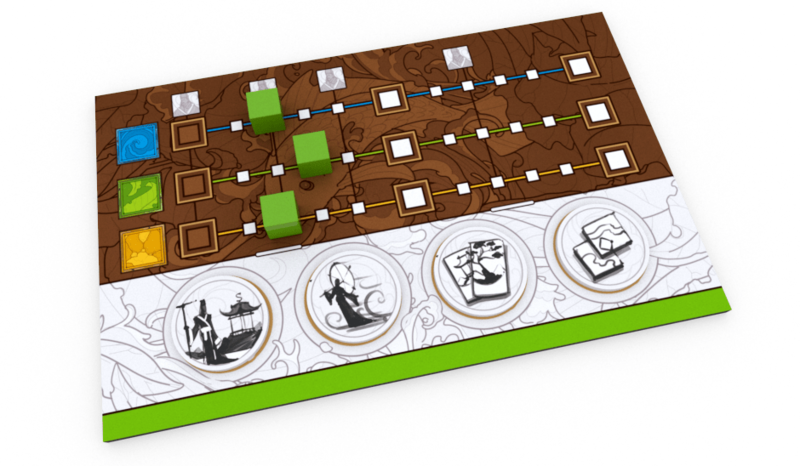 When a tile is placed on the board, for each matched element the players will get bonuses and advances. On the player boards the levels for water, rock and vegetation will indicate the progress of each player on their natural balance. It will be significant not to oversight any of them to obtain the maximum prestige and attract the attention of noble characters. 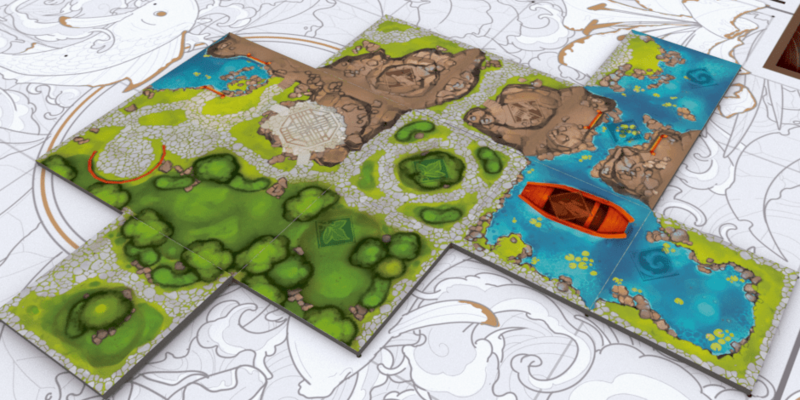 The game board is the white canvas where players will progressively build the garden by placing elements on it. The minimalistic vibe of a chinese handmade game board will give freedom of creation and enhance the colorful experience of the continuous evolution of Nature. Your Garden will start becoming alive by placing the tiles, but Tang Garden is a game of poetry and romance. 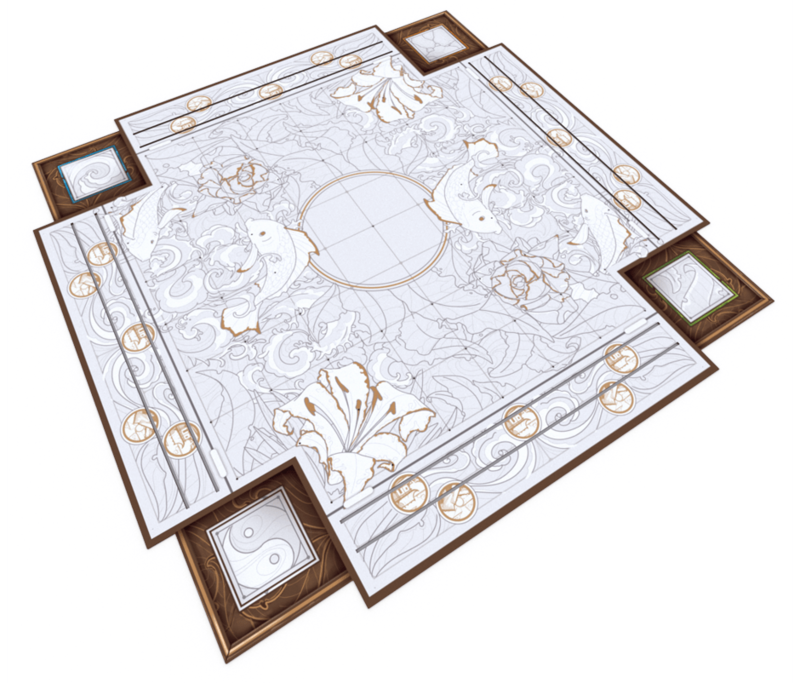 On top of the placed tiles, players will be able to decorate the scenery. 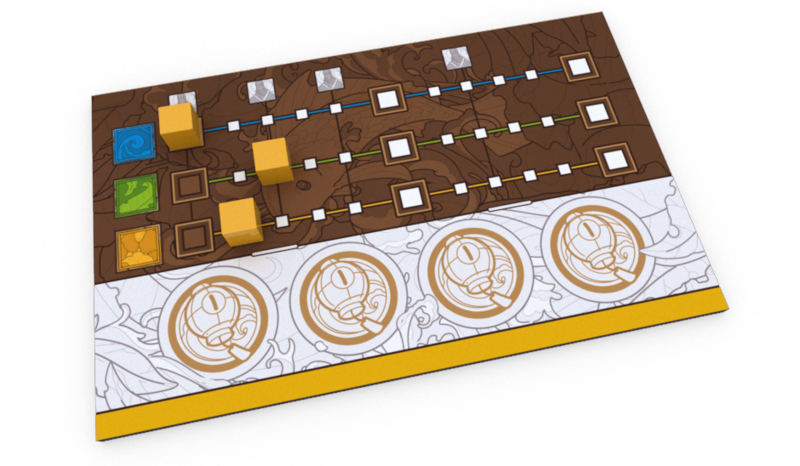 Players will draw a quantity of cards based on the board situation and choose one to keep. Players will then have to place the chosen decoration in one of the available spots in the garden, creating a unique and seamless scenario that will never be the same. Each decoration will allow players to obtain small perks during the game and prestige in different ways in the final scoring based on the collected sets. Enrich ponds with sparkling fish and precious lotus flowers, the gardens of delicate peonies and trees from different parts of China and finally place the beautiful traditional pavilions and bridges to open up incredible observation points for the characters that will visit the garden. Balancing the elements on a garden was not the only important rule to follow. The location and orientation of the garden was fundamental to create a progressive perspective of the surrounding panoramas to give the feeling that the garden didn’t have an end. During the game, by placing tiles on special parts of the board, you will be able to place a panorama tile, a new element that adds a never ending perspective for the visitors. Both small and big panoramas will be placed perpendiculary to the board by attaching it to the board insert by creating a seamless look on the four sides of the board. The Panoramas will interact with the characters at the end of the game by giving prestige points based on what your visitor sees and likes. Tang Garden is inspired by a real story that takes us back to the eighth century, a golden era for the Chinese art and culture. The garden of the majestic lake was requested by the emperor Xuanzong for his loved Yang Guifei and will be populated by the different miniatures inspired by characters that really existed. The artist loves the waterfalls and is seen regularly painting beautiful landscapes, the poet contemplates the water and writes poems about the moonlight and the hermit observes the rocks that reminds him of his beloved mountains. Each character in the game will have a unique taste and it will be the player’s responsibility to make sure the characters will never forget such breathtaking sight. By balancing the nature elements on the player boards, players will attract new characters into the garden. On each player turn, if the elements are balanced, the player will have to choose one miniature from the ones available and finally decide which one of the characters will be placed in the garden, orienting them towards their favorite background, while keeping the other with you to keep exploiting its ability. We are working actively on improving the rules before going into proofing that will be leaded by our friend Keith Matejka (Bullfrogs, Roll Player). We really appreciate your valuable input on it. If any questions while reading please let us know in the DropBox comments. We will reply to you there and we will update the rulebook accordingly. The living rulebook can change at any time, initially even within hours. You can find the version in the button below. 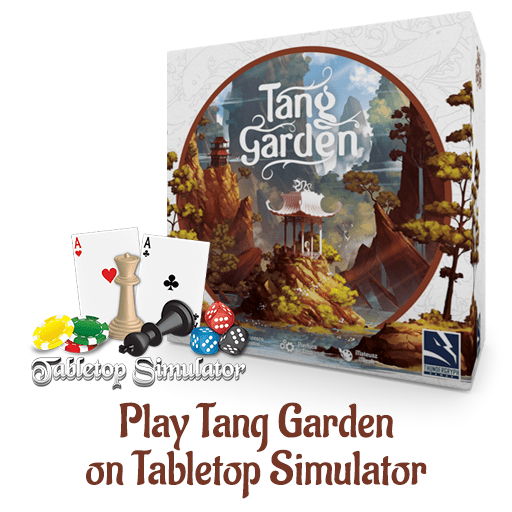 You can play the multiplayer version (2-4 players) of Tang Garden in Tabletopia or Tabletop Simulator. The Solo game will come soon! You can join our Discord Channel if you want to play with the team, we will gladly explain you the game in five minutes too. Discover Tang Garden and win the game! It looks amazing. I like the theme a lot too. Looks like yet another masterpiece! Let the zen unfold! Big words Micheal! Thank you so much! Absolutely love the theme. This is one gorgeous looking game so far. Wow! I love the games that Thundergryph produces; each one is a unique, beautifully designed gem that is perfect for game collections everywhere! You are very kind Vince! 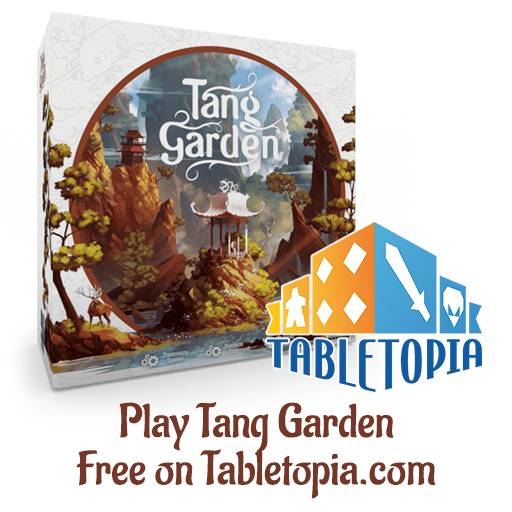 Thundergryph Games has given Tang Garden the best shape possible. For me it’s a dream and a honor to work with this wonderful team! Really good loking …I’m IN! I like the idea of having 3D Elements at the board tiles like the bridge. It really looks a nice product. I can not wait to learn more about it. The game looks very good as usual! I look forward to have more info on the rules and the components. Looks great! Can’t wait for more info! Great news! Looking forward to this new game! Sonia thanks for your continuous support! Love the visuals so far. Interesting, can’t wait to see more mini ! It will be very nice companion to Tao Long! Another beautiful game from Thundergryph! Absolutely I am in! I think I’ll have every single game from ThunderGryph Games, every single one is a gem beautifully crafted, it’s amazing how every little game looks like a little treasure worth keeping 😉 I haven’t received yet any of your games though, but I’m eager to learn if the gameplay in all of them will be just as beautiful as the art. Tang Garden is looking no less gorgeous. I’m super interested in the theme and curious to learn more about the gameplay. Lovely artwork. Awesome ! Super duper beautiful ! Thundergryph makes totally gorgeous games. I just can’t resist backing them! As always, the game looks stunning and I can not wait to check it out further! I’m already thinking it will be a great addition to my collection alongside Tao Long, Dead Man’s Doubloons, and Overseers! Excited to see this one launch! I can’t wait for this to launch, it looks so good! Will there be a deluxe edition? That’s a very interesting question Lokee! I’m curious to know if there could be a market to make a production for them. Thank you Bill! Can’t wait to unveil more about it! The game looks beautiful. I’m looking forward to seeing more detailed information. Not seen many games like this, it looks beautiful! I’m quite interested to find out more about it! The art is exquisite if the game is the same it will be a must have.